With Angkas becoming legal again, a lot of Filipinos see this as an opportunity for a job. As a matter of fact, a huge percentage of Grab users switched to Angkas because it is a lot cheaper. In addition to that, the traffic that almost all cities in the country has to offer is not becoming any better, this is why a lot of Filipinos patronize the use of motorcycles than cars. 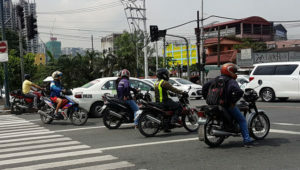 There is an everyday-increasing rate of motorcycles on Philippine roads and streets. Over the past few years, these numbers skyrocketed and it’s mainly because of the efficiency and the effectivity of riding motorcycles than riding cars. But that’s not a problem, right? Because these riders are educated and knowledgeable in the road, right? Are we sure about that? Are we a hundred percent sure that these riders, operating these motorcycles are knowledgeable enough to keep themselves and other motorists safe? Well, you might want to think twice on the data Top Gear Philippines were able to gather. The Motorcycle Philippines Federation (MCPF) made a statement about motorcycle riders in the country. As they were speaking with ABS-CBN News, Atoy Santa Cruz, President of the MCPF said that in a total of 9,000 riders who took the traffic rules exam of his agency over the past two (2) years, only seven (7) were able to pass. I know, that sounds ridiculous, right? Out of almost the 9,000 who took it, only a mere seven (7) passed the exam or the assessment. If we were to put that in percentage, that is less than 0.10% of the total figure. It’s quite alarming, considering the fact that there’s a total of 8.7 million private vehicles registered to the LTO for the year 2015, 4.8 million of those were motorcycles. This was based on the data submitted by the Metropolitan Manila Development Authority (MMDA). Santa Cruz said that before the MCPF seminars which talk about road safety was when the tests were given to the riders. This is also one of the reasons why the MCPF is totally in favor or the bill filed by Senator JV Ejercito. Senate Bill 1822, or the Mandatory Motorcycle Safety Training Program, authored by Senator JV Ejercito, aims to create passing the safety training program a mandatory thing for motorcycle riders. This is not only to prevent accidents and casualties on the roads, but also because it will educate motorcycle riders to register their vehicles and licenses accordingly to the Land Transportation Office (LTO). Currently, this bill is pending in the committee level and they are wishing for it to become a reality. Santa Cruz told ABS-CBN News that they have been longing for this bill to be signed into law. To give it to you simpler, Senate Bill 1822 requires the training program for safety as a requirement before a specific motorcycle owner successfully registers his or her motorcycle at the LTO. So, people who won’t be able to pass it, will not be issued a registration. Therefore, that specific vehicle will not be able to roam the roads of the Philippines no matter what. What can this bill do to our traffic? Other than the fact that it can lessen casualties and major road accidents caused by irresponsible motorcycle drivers, it can allow our roads to become cleaner and safer to travel on. With this bill being in place, people will be more likely to be more educated on roads; people will have more wisdom in tackling roads. Most importantly, there will be less and less casualties and accidents on roads. Read: How Can You Verify a Plate Number Through the LTO? As per data from the World Health Organization’s (WHO) Dr. John Juliard Go, a total of 11,264 deaths account from accidents on Philippine roads. About a total of 5,970 or 53 percent of that complete figure were either passengers or riders of motorcycles, tricycles, and other two– or three-wheeled vehicles. So, this really is taking a toll on the statistics of death that are found on Philippine roads. This is a figure that can greatly be improved if the knowledge and the responsibility of everyone who travels on roads and major highways are improved. Seven passers out of 9,000 applicants is alarming enough. Everyone do hopes that the Senate Bill 1822 becomes into law so that catastrophic fatalities that happen on roads will be lessened.